Bryant Park Blog: You're Invited: ESPN's "First Take"
You're Invited: ESPN's "First Take"
Let the Super Bowl fun begin: We're excited to announce that next week, starting Monday, January 27th, our Bank of America Winter Village rinkside restaurant Celsius will host the ESPN/Bud Light Broadcast Center. 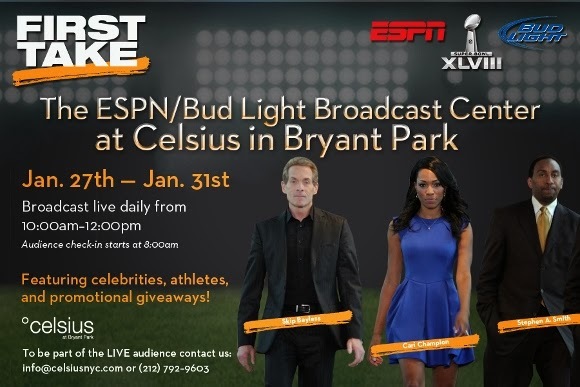 First Take, ESPN's nationally televised #1 show, will be broadcast live at Celsius, and Bryant Park fans have an opportunity to join the studio audience. Contact info@celsiusnyc.com to be a part of the live audience next week, and if you're one of the first twenty people to RSVP at the email address above for Monday morning's taping, you get a free VIP pass* to The Rink at Winter Village! That means free Fast Pass admission, skate rental, and bag check. Need more incentive? How about promotional giveaways for guests? Or appearances from NFL players, actors, and musicians, like Osi Umenyiora, Denis Leary, Colin Kaepernick, Holly Robinson Peete, Wale, Justin Tuck, Cam Newton, and a whole lot more? OK, football fans, we'll see you at Celsius in the park next week.